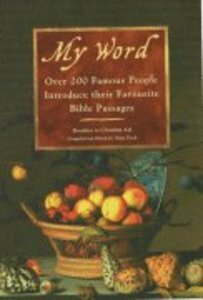 A unique and fascinating collection of the favourite Bible passages of 200 celebrities, including Michael Aspel, Jonathan Dimbleby, Margaret Drabble, General Sir Charles Guthrie, Joanna Lumley, Ruth Rendell and Princess Michael of Kent. Each contributor gives a short but very personal and insightful explanation of what their chosen passage means to them. Royalties to Christian Aid. - Publisher Over 200 celebrities, including Michael Aspel, Penelope Keith, Sir Harry Secombe, Joanna Lumley, Ruth Rendell and Nigel Havers, explain which part of the Bible is closest to their heart and why. Over 200 celebrities, including Michael Aspel, Penelope Keith, Sir Harry Secombe, Joanna Lumley, Ruth Rendell and Nigel Havers, explain which part of the Bible is closest to their heart and why.